converges rapidly to a value that is the square root of the number in the first box (here 9). If you changed that number to 25, the state machine would converge to a state of 5, and if you changed the number 9 to the number 2, the machine would converge to a state of 1.4142… This is quite a practical way to compute square roots, and Wikipedia claims that this method was already known to the ancient Babylonians. In the situations where the repeated pressing of “Next” does not get us closer and closer to a particular value, it is usually very important to keep track of how many times the button has been pushed. is quite useful to generate powers of 2. When you hit the “start” button, the state is set to 1, and subsequent presses of “next” will generate 2, 4, 8, 16,… But how would I use this machine to get me ? After “start”, I’d have to press the “next” button precisely 20 times. This is not difficult, but it is very error prone. 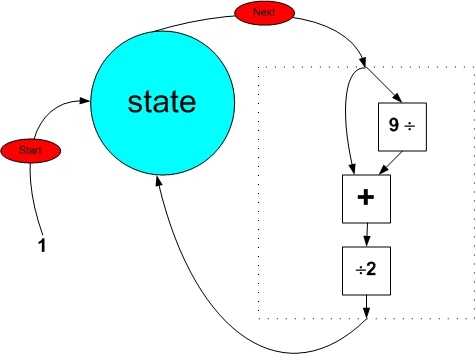 In this diagram, we have a state machine on the left that generates a counting sequence: 0, 1, 2, 3, …; and the powers-of-two machine on the right that generates the sequence 1, 2, 4, 8, …, and the idea is that we can couple these two machines, so that they move in sync with each other. We might think of a big Start button that, when pressed, causes both of the start buttons shown to be pressed, and a big Next button that, when pressed, causes both of the next buttons to be pressed. When the two machines are coupled this way into a single machine with two screens, we can think of the states as being coupled also. On hitting Start, the screens show 0;1, after hitting Next we see 1;2 and after hitting Next again we see 2;4. No matter how often we hit the Next button, the state of the “+ 1” machine will always indicate how many times we’ve multiplied by 2 in the “× 2” machine. Another way of saying this is that when the state of the “+1” machine is , the state of the “× 2” machine is . 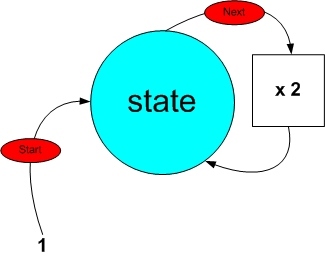 In the next blog post in this series, we’ll model the same behavior using a single state machine. This entry was posted in Uncategorized and tagged black box, equivalence, extending patterns, invariants, recurrence relationship, representations. Bookmark the permalink.